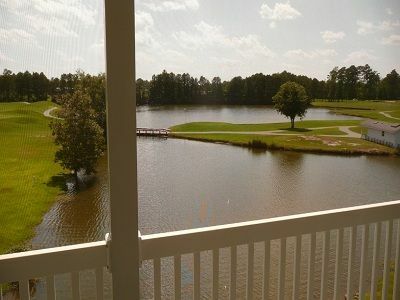 Aberdeen Country Club on Lake & Golf Course **See Free!!! Enjoy the peace and quiet of Aberdeen Country Club while you view the beautiful lake, 27 hole golf course, and the swimming pool from our third floor walk up condo (no elevator). You can enjoy the view from the master bedroom and bath, kitchen, as well as living room and dining room with a cathedral ceiling and huge framed mirrors for expanded fairway views. You can access the extended porch through full view sliding glass doors from the master bedroom and living area. We have several onsite amenities at Aberdeen Country Club. There are three swimming pools, hot tub, tennis court, 27 hole golf course, driving range, miniature putting surface, and charcoal grills. There is no fishing allowed on the golf course lakes. However, if you have small children, you can feed the fish and turtles with bread crumbs from the water front. You will be surprised how many you can attract. You have easy access to anywhere on the Grand Strand via Highway #9 and the new Highway #31 Myrtle Beach Bypass west of the Inter-coastal Waterway. Travel four lane highways (65mph) and bypass Highway #17 Business traffic to get to your destination. Visit the beaches, theaters, night clubs, restaurants, shopping and outlet centers, and 100 golf courses. Hwy #9 in front of Aberdeen Country Club is a four lane hwy that goes directly to Cherry Grove at North Myrtle Beach and dead ends at the ocean (15 to 20 min away). * Linens and towels for six people. * Departure cleaning fee (4 night minimum stay). My wife and I are retired. I am an avid golfer. (played 70 rounds of golf in 2012). We come to Myrtle Beach about 10 times a year from our North Carolina home. We also have a beach condo on Shore Drive (click on view our other properties link). We also have a fireside condo at Jeremy's Lodge in Jefferson Landing Club in Jefferson, NC in the Blue Ridge mountain and located on the New River. We visit our properties regularly and do our own maintenance on a regular basis. Our properties always receive 5 star reviews. Aberdeen Country Club has a very nice 27 hole golf course, I really loved the low density population in Aberdeen Country Club. There is only one street with condos on either side of the street. There are not rows and rows of condos or houses for that matter in this community. It is a very quiet and a very neat community. We are away from the loud noises and rowdiness found in Myrtle Beach. Very relaxing!!! Absolutely beautiful views of golf course and lake - especially the sunsets from the opposite side of the lake!!! Pool and grills are beside our building. Very quiet and relaxing neighborhood. The property is always manicured. We love it!! Absolutely beautiful golf and lakefront view!! Would stay here again in a heart beat. Loved looking at lake and watching the turtles play. Beautiful condo. Had all the amenities. We absolutely LOVED our stay!!!!! Clean, and well kept villa. Brian was so helpful from the start, and easy to get in touch with, and responded promtly. We'll be back for sure!!! If you want to be away from the crowds and noise and just relax on vacation! This is the place for you!!!! Brian, the owner was very easy to work with. The view was great! We did see an alligator swimming on our last day. Our family enjoyed sitting outside on the screened in porch. We were six (4 older children) and slept comfortably using the pull out sofa along with an air mattress we brought. You are only about 15 minutes from North Myrtle Beach. There was an issue with the washer machine. Brian was very QUICK to resolve the issue. He ended up getting a brand new washer delivered! The place was very clean. The complex was very quiet. The pool was just a stones throw away. The kitchen had all the basics that was needed. We were even allowed to use the beach umbrella and chairs that were in the storage closet! I would recommend staying here! We will if/when we go to Myrtle Beach again! Thank you so very much for such a great review. We try very hard to be sure that our condo is clean and well maintained and our guests are happy. Since the washing machine could not be repaired we had a new one delivered asap. We are glad that we could take care of the issue quickly. Glad you enjoyed the view and quiet complex. We also love the great view from the back porch especially the gorgeous sunsets over the lake. Hope you will return soon and tell your family and friends about our condo. Great cozy condo. Place was so spotless and everything you need to make a great vacation. Very family friendly and pools and grounds are beautiful. Well definitely be back again. Only a short drive to beach and all the attractions. Thank you Brian and Candice. FREE!!! for all stays - 4 night minimum stays FREE!!! Linens & towels for 6 people FREE!!! Departure cleaning (we pay $100 so you don't) FREE!!! WiFi & free long distance in US FREE!!! Discount Fees paid by owner for Master Card-VISA-Discover charge cards (2.5% of total) Saturday to Saturday only rentals when renting 7 nights Must be 25 years old to rent. No smoking, pets, motorcycles, trailers, 2 car limit. CHECK IN PROCESS IS AS EASY AS IT GETS--Before you depart for the condo, we will give you a four digit code to enter into a key lock box mounted on the front door which has 2 keys. Each key operates both the dead bolt and regular lock to the front door and the storage closet ("H") on the porch with beach chairs and replacement slats for the sliding door blinds. Enter the condo and go to the end of the kitchen counter top and find 2 parking permits. Place these on the rear view mirror or on the dash in plain sight. BE ABSOLUTELY CERTAIN YOU RETURN THESE ITEMS WHERE FOUND WHEN YOU LEAVE SO THAT THE INCOMING GUESTS CAN HAVE ACCESS TO THEM.